The Dominion Residential App gives creative users the tools to customize and design their own space from the comfort of their smartphone or tablet. Take a photograph of a room, add products, scale them to the room’s dimensions, and arrange them for the perfect look. Simply tap a product to see prices, descriptions, and more. You can add products to your own personal portfolio, or save entire room designs. Search “Dominion Electric Supply” in your App Store. If you need guidance with your lighting selections, our e-lighting Consulting Service is the thing for you! We can assist you in making your space shine. Simply email a photo of the room you need to light, along with dimensions, to: e-lightingdesign@dominionelectric.com. 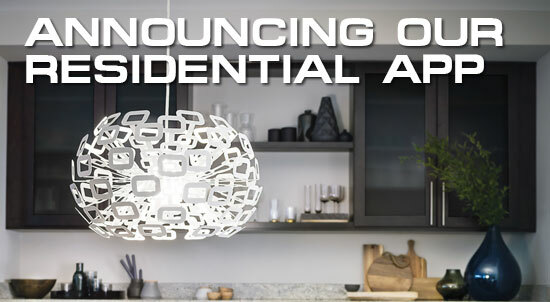 We will connect you with one of our Residential Lighting Consultants. Answer a few questions and they’ll do what they do best: select and layout lighting options that are just right for your space. *The first hour of consultation is free; additional hours are billed at $100 per hour. Expect our consultant to review your room(s), prepare a couple of virtual lighting concept boards for review, and provide a quotation for fixtures featured. Additional costs apply to the purchase and delivery of fixtures. A licensed electrician is required for installation. If you are unable to fill out form please download the pdf form. For best results viewing this PDF use Acrobat.